That day came on Saturday, November 2, 2013. Mucho Macho Man would face one of the toughest fields in the history of the Breeders’ Cup Classic, including: Fort Larned, the previous year’s champion who narrowly beat Mucho Macho Man in 2012; Will Take Charge, who would go on to win the 3 year-old Eclipse award; and Game on Dude, on his home track, riding a powerful six race-winning streak. 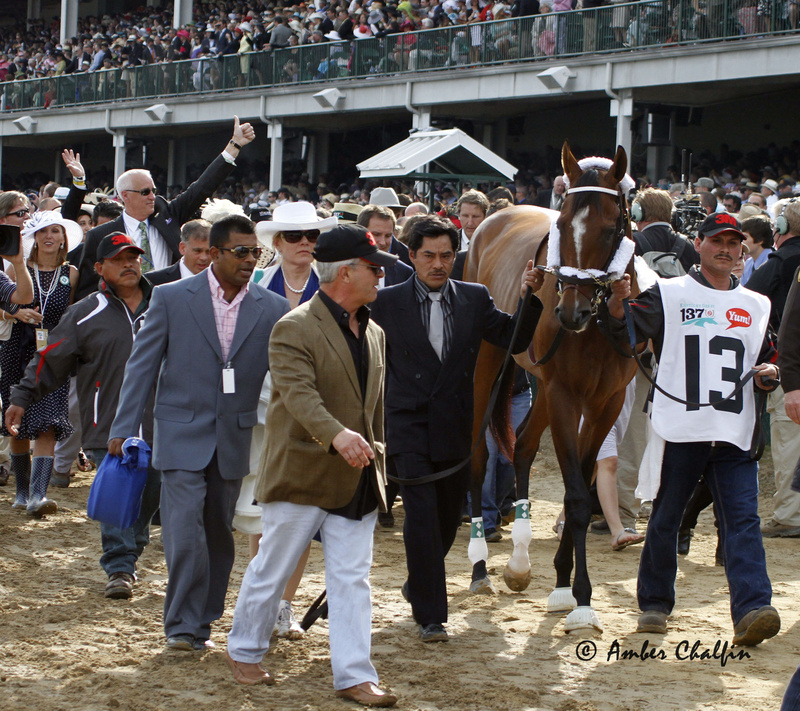 Maybe you are one of the tens of thousands of Mucho Macho Man fans that propelled him to win The 2013 Secretariat “Vox Populi” award as the horse best exemplifying the heart & soul of racing, and know what happened that day. Know that it was not just a race, it was as fans and the NTRA named, “The Moment of the Year,” for more reasons than one. Maybe you are a young racing fan, reading this page for the first time, curious about what happened on that fateful day. As you read on, you will learn, hear, see and feel, what happened that day was about so much more than Mucho Macho Man taking the lead as they headed for home, and with every ounce of his heart, holding off a furious charge by Declaration of War and Will Take Charge in a photo finish for the ages. 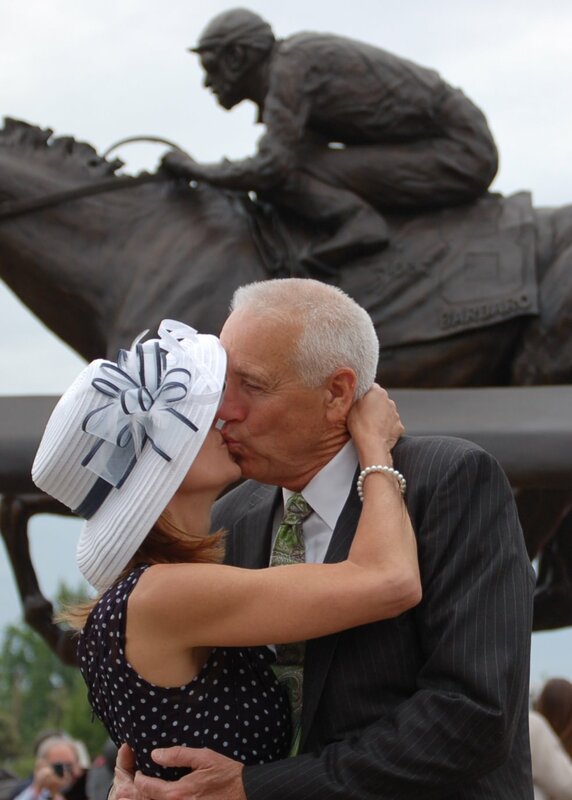 Yes, Mucho Macho Man is our star, but his story is forever woven with the lives of his Trainer, heart transplant recipient Kathy Rtivo; Hall of Fame Jockey Gary Stevens, and many others who helped make him the Champion he is today. 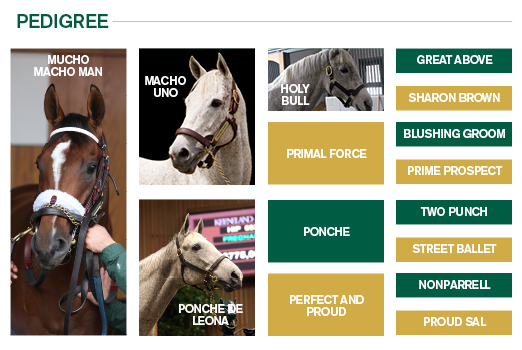 We are very thankful for the support and love of all our fans and hope you will enjoy Mucho Macho Man’s web page. Dean & Patti Reeves. In July of 2010, Dean Reeves and Tim Ritvo watch Mucho Macho Man finish a gusty second in a maiden race at Calder Race Course and Dean is instantly impressed “Call me crazy, but I like the second place horse,” he says. Mucho Macho Man breaks his maiden at Monmouth Park on Sept. 19, 2010, tracking the leader and drawing clear in the stretch for a powerful four-length victory with jockey Eibar Coa aboard. In November of 2010, a young and developing horse, Macho would make his first starts in graded company in the Grade 2 Nashua Stakes and Grade 2 Remsen, finishing second both times behind To Honor and Serve – he would avenge these losses in stunning fashion in 2012. Derby dreams arise on Feb. 19, 2011 as Mucho Macho Man captures his first graded victory in the Grade 2 Risen Star. Stalking the leaders and surging down the stretch for victory, this would become his signature style. 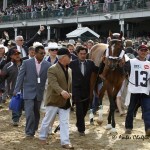 On March 26, 2011, despite losing a shoe, Macho earns his ticket to the Kentucky Derby with a gritty third place finish in the Louisiana Derby. With a legion of fans from Georgia rooting for him, on May 7, 2011, Mucho Macho Man would finish third in the Kentucky Derby, behind future Dubai World Cup Champion, Animal Kingdom. 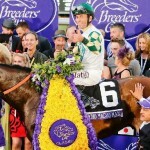 In June of 2011, Mucho Macho Man, one of the youngest horses ever to compete in all three jewels of the Triple Crown, not turning 3 until after the Belmont Stakes, earned a much-deserved rest. Macho basks in the sun on Jan. 28, 2012, under a flawless ride from Ramon Dominguez he returns to form with his signature performance in the Sunshine Millions at Gulfstream Park, holding off multiple graded stakes winner, Ron the Greek. On March 10, 2012, Mucho Macho Man would real off his third straight win in the Grade 2 Gulfstream Park Handicap. Macho gives a bravura performance in the Suburban Handicap at Belmont Park on July 7, 2012, avenging his loss to To Honor and Serve and winning under a hand ride. His sights now set on the Breeders’ Cup Classic. On November 3, 2012, Mucho Macho Man was ready to take on the worlds best at Santa Anita Park in the Breeders’ Cup Classic. However, on this day, despite giving every ounce of his heart & soul, Macho could not get by Fort Larned and finished a proud second in one of the great Breeders’ Cup Classic finishes. Sent to Fair Hill Training in early 2013 after developing a bacterial infection, Macho has a slow start to his 2013 campaign with two third places finishes in the summer and sets his sights once again on the Breeders’ Cup Classic. 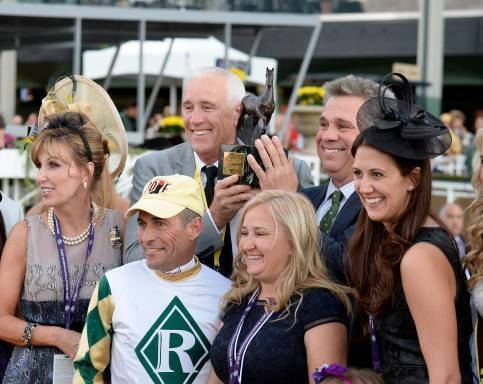 With his new jockey aboard, Hall of Fame legend, Gary Stevens, coming out of a 7 year retirement at age 50, Mucho Macho Man scored his long awaited and well deserving first Grade 1 victory on September 28, 2013, in the Awesome Again Stakes at Santa Anita Park. And awesome he was, leaving the field behind in the wake of his signature running style. He left no doubt that day he was ready for a return trip to the Breeders’ Cup Classic. 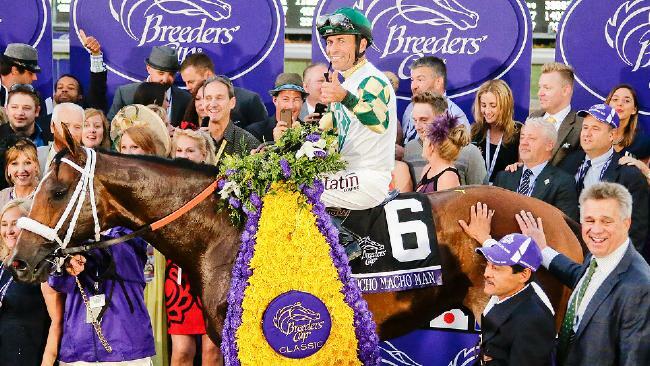 On November 2, 2013, facing one of the toughest Breeders’ Cup Classic fields ever assembled, including previous winner Fort Larned, Mucho Macho Man became champion, stamping his name forever in Breeders’ Cup history by holding off a furious charge from Declaration of War and Will Take Charge in a photo finish for the ages. Powered by tens-of-thousands of fans, on December 26, 2013, Mucho Macho Man wins the Secretariat “Vox Populi” as the horse that best exemplifies the heart and soul of racing. 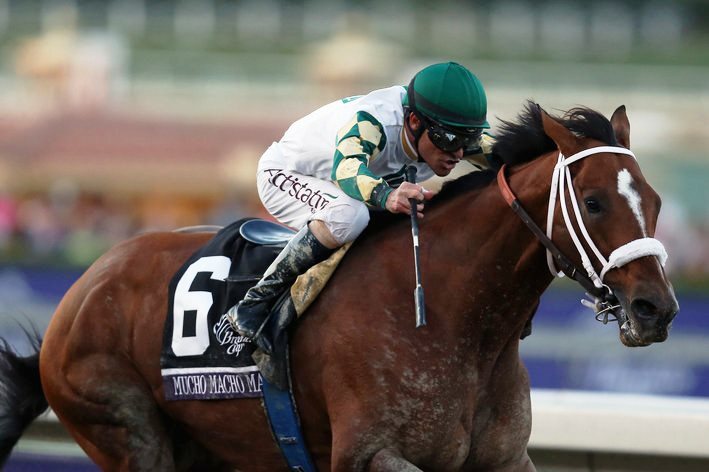 Mucho Macho Man’s thrilling victory in one of the closest Breeders Cup Classics ever is named NTRA’s “Moment of the Year” on January 19, 2014. Mucho Macho Man shines in his 2014 debut in the Sunshine Millions at Gulfstream Park on January 18, 2014, winning by 14 lengths in his third straight victory.